QL connectors require no tools so set-up is always fast and simple. The Entasi™ frames are constructed using 1¼″ anodized 6063-T6 aluminum tubing. ** For convenience and quick assembly, the tubing is shock corded together so there is no need to sort and match up parts. Additionally, we rivet half the connector to the tubing to assure proper positioning and minimize the amount of loose parts. 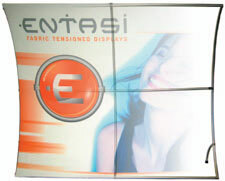 Entasi™ frames are extremely durable and lightweight. Every frame comes with simple but detailed instructions and can be set up in minutes. *Some accessories, 20′ Frames, Tabletop Display Frames, and Double Sided Frames require a hex wrench. **Table Top units use 1″ tubing. The main graphic is produced on a wrinkle resistant, flame retardant fabric via an exclusive Photo Fabric dye sublimation process. By using a “pillow case” construction and our exclusive Clean Fit Backer, we eliminate shadowing and ensure a smooth and snug fit. 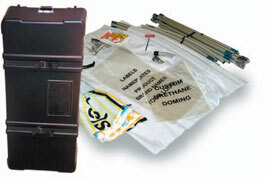 Podium graphics are also produced using the Photo Fabric process. Graphics used on the stand-offs are produced, using the highest quality digital photographic equipment, on a clear or flex substrate. 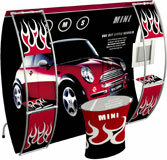 Most frames are also available in a design to accomodate double sided graphics. Occasionally, certain graphics and lighting require a liner for added opacity. Our unique Flex-Fit liner provides added opacity without creating puckering and wrinkles associated with lower quality fabric displays. Standard finishing includes our exclusive Clean Fit Backer, which produces the cleanest and smoothest graphic cover available. Clean Fit Backers are available in a variety of stock colors at no additional charge. Depending on the accessories, an entire 10′ Entasi™ will ship complete in one small shipping case with wheels. 20′ units are compact enough to ship in just one of the larger cases. * Each case can be shipped via FedEx or UPS and the smaller case can be checked as luggage with most airlines. Both cases include wheels for easy transport. For protection, all parts for the external frame are sorted into individualized pouches and packaged in one convenient durable bag.